9/20/15 - Prometheus Design Werx (PDW) has released their Odyssey Cargo Short; made from premium-grade, pre-shrunk 100% cotton rip-stop. 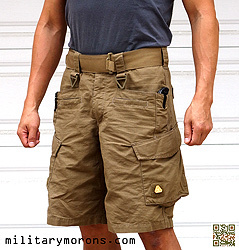 It's a feature-filled short made in the U.S.A.
Prometheus Design Werx - If the overall look of the Odyssey Cargo Short bears more than a passing resemblance to the Triple Aught Design (TAD) Force 10 Cargo Shorts reviewed seven years ago, you're not imagining things. Patrick Ma, the founder of TAD, is also the co-founder of PDW. Patrick separated from TAD in 2013, and co-founded PDW with Chris Whitney about a year later. PDW is a continuation and evolution of the design ethos that Patrick has developed over his lifetime; not a re-invention, which is why the new Odyssey short bears the aesthetic 'signature' of one of Patrick's designs. With PDW, Patrick was able to create a new work environment with a team of colleagues, that allowed him to stick to his core design sensibilities. PDW's mission is to craft exceptional, multi-purpose performance apparel, equipment and accessories for the individual who values adventure, self-reliance, and challenges on and off the grid. Description and Features - The Odyssey Cargo Short 100RS is made from premium grade, pre-shrunk, 100% cotton ripstop fabric, available in Dark Leaf Green or the Dark Arid Earth shown here. It's made in California. The Odyssey has 11 pockets, and this first production run is generously sized to allow users to carry IWB comfortably. The Odyssey Short draws from the practical details found in American military utilities as well as classic and modern work wear. Styling is an academic consequence of form following function, with Patrick's signature look. Not wasting anything; the hang tags are reusable as coasters and the cordage is 100% jute and can be used as tinder. Material: 100% cotton ripstop, pre-shrunk less than 1-2% shrinkage. Custom no-twist delta-ring hardware. This is a triangular delta ring, rather than the more common D-ring and has been custom molded with PDW markings. There are two delta rings located below the two front belt loops, and two more inside the side cargo pockets. Custom parasmock-type slotted buttons - Also custom molded with PDW markings, the slotted buttons are used throughout. Extended double seat reinforcement - Instead of the normal rounded double seat, the Odyssey seat reinforcement is angular, and extends to just below the rear flap pocket openings. Diamond shaped gusset for extra mobility - no split crotch here when you're doing high Taekwondo kicks, rock climbing or just squatting. Loop swatches on each cargo pocket for small patch - There's a 1.5" square loop velco patch near the front of each side cargo pocket for cat-eyes or small velcro patches. My only complaint with the supplied PDW logo patch is that the velcro isn't very secure. Take it off before washing, for sure. Includes non-toxic, medical grade "PVC" PDW logo patch - Take this off before washing as mine wasn't very secure. Low profile shaped gusseted cargo pockets, 3-point flap closures (two velcro and one button) - Instead of the angled corners of the TAD Force 10 pocket flaps, the Odyssey has a single point in the middle. The flap is secured either with two velcro patches, or a central slotted button (or all of them). I typically leave it unbuttoned for quicker access to the pocket. The pockets are 7.5" wide, and 8" tall in the rear and 7" tall in the front. The rear is gusseted and expand to 2" deep. A delta ring is sewn to the end of a 3" tab, as a dummy cord point. The middle of the flap has a 3" opening for passing through items that are taller than the pocket, like hammer handles etc. There's no internal pocket inside the main pocket, so there's no internal organization. Dedicated EDC tool pockets for today’s folding knives, multi-tools, and flashlights - This is a 5.5" deep x 2" wide slot pocket located near the rear of the main hand pockets. I found it to be extremely versatile, as it'll fit most small folding knives, AA or CR123 flash lights, and medium-sized multitools. The pocket is deep enough to carry items without using a clip for more discreet carry. Access is slower, of course. The slot pocket can be used to carry an item with the clip facing the outside, or inside the pocket. Keeping the clip inside prevents you from scratching stuff you brush up against (like cars) as you walk past. The pocket can also be used to clip an item onto, with the item inside the main hand pocket. Or, you can just bypass the slot pocket, and clip the item inside the main pocket with the clip on the outside of the pocket. Hide-away pocket inside rear waistband for spare cuff key, cash, etc - This is a small 2.75" wide x 1.8" deep flat pocket attached on the inside of the waist band, near the center of the back on the left side. It flaps out for a key, money etc, and is then tucked into the waist band. When empty, I found that it would sometimes end up halfway out of the waist band, if the shorts rode down, so I'd love to see a small 1" square velcro patch hold it to the inside of the short. Horizontal hand pockets inspired from work wear, which allow user access even while wearing pack, 1st line or tool belts - These are a departure from the side slash pockets of the TAD Force 10 pants/shorts, and reminiscent of the Crye Field Pants or regular Levi's jeans. They're about 8" deep. There are pros and cons to this design. The opening is tighter, and not as comfortable to stick your hands in when walking around as side-slash entry pockets. The plus is that they're better at retaining items; you're much less likely to have pocket change or keys falling out when seated. In fact, it's practically impossible to retrieve items inside the pockets when seated normally without shifting around. More secure, but less accessible. Coin trap or small folder pocket inside main hand pockets - I've always appreciated this feature as it segregates small items like change and keys from the other items in the front pockets. The pocket is 3.7" deep and 3" wide. Seven belt loops - Belt loops are 1" wide and accommodate belts up to 2.5" wide. Dual back pockets with button flap closures - The rear pockets are internal (not patch pockets) and measure 6-8" deep and 7" wide - very roomy. Each is secured by a flap with covered slotted button. The openings are canted/slanted to the outside for easier access. Widened front welt pockets for larger smart phones - These are practically sized at 6" deep and 4" wide. Larger than the Force 10 or Crye besom pockets, they fit a greater variety of items like smart phones and sunglass cases. Utility fit - accommodates IWB (waist is about 3 inches larger than marked size) - more on this below. Fit/Sizing - According to PDW, "The Prometheus Design Werx Odyssey Cargo Short is our first apparel style offered in the US Market. The stock made available in June of 2015 was reallocated from inventory that was originally produced for the European Union. The sizing of this first production run was graded to include room for users to have the option to comfortably carry IWB and may feel more generous than other shorts in this category of field shorts. Subsequent productions runs will be offered in a wider size range which will allow users to choose whether they wish to have the extra room for IWB or select a fit in the waist that is more typical of the industry standard." Since I don't carry IWB, I decided to go with a smaller waist size, hoping that I wouldn't have to wear a belt. From past experience with TAD Gear shorts and pants, their waist sizes are always oversized to accommodate IWB; typically a couple of inches larger than the marked waist size. So, I figured that the Odyssey shorts would fit similar to my TAD Gear shorts since Patrick Ma was behind both designs. My measured waist size is 32", so I chose the 30" waist Odyssey shorts since I didn’t plan to use them with a IWB holster. The 30" are still loose enough around my waist such that I have to wear a belt. After the minimal shrinkage from washing/drying not, the actual waist size of the 30" marked short is 33" measured. One feature I’d love to see is a simple webbing waist adjustment tab like the Prana Stretch Zion pants and shorts have (love those things). So, take heed - the actual waist size is about 3" larger than the marked waist size, so choose accordingly, based on your need to carry IWB, or not. Overall fits is great; not too baggy nor tight. Notes and observations - As I mentioned above, the PDW Odyssey Cargo Short should be considered an evolution of the TAD Gear Force 10 Cargo short, and builds on it rather than seeks to deviate from it just for the sake of doing something different. It's familiar, yet more refined than the Force 10. I really like the move to a single button for rear and side cargo pocket closures; securing the pockets is much faster with only one button vs. two. Some may not like the use of velcro to secure the side cargo pocket flaps, but I prefer this to buttons only. It's faster as you don't have to button the flap down under normal use. With its 13 pockets, the Odyssey short is great for organizing all the things I carry on a daily basis. I've always appreciated the small coin traps inside the main front pockets for keys, change etc. The larger besom/welt pockets are also appreciated, as I can better carry larger flat items like a smart phone or my wallet. I use these pockets a lot for all sorts of items. They're surprisingly deep, as you can see in the photo below - a 30-round M4 mag barely peeks out the top! The Force 10 shorts had reinforcement at the opening of the side slash pockets. The Odyssey has horizontal hand pockets instead, which aren't as comfortable for keeping your hands in, but definitely more secure. The new EDC tool pocket at the rear corner of the (where the Force 10 reinforcement was) is a really practical addition. I didn't realize it until I started using it. The pocket can not only be used to carry a folding knife, small flashlight, multitool etc; but also provide different clipping options. A knife can be carried inside the main pocket with the clip on the outside, or with the clip in the EDC pocket. Or, it can be carried inside the EDC pocket with the clip on the outside or inside. Or, it can be completely inserted into the EDC pocket without using the clip. I like having the clip protected as it's less liable to scratch my car if I brush against it, and more discreet than having the clip exposed. Clips on the outside of pockets always catch my eye, and it's easy to spot someone carrying a folding knife in their side pockets. The hide-away waistband pocket can sometimes pop out of the waist band if empty (like when untucking a shirt, or just from the shorts slipping down the waist). I'd like to see a small velcro patch sewn between the pocket and inside of the short so that it's retained there better. I'd also love to see a simple adjustable webbing waist belt incorporated into the waist band, like that on the Prana Stretch Zion pants and shorts. I don't wear a belt unless I have to, and having a means of tightening the waist would be nice. It's been a hot and humid summer lately, and the 100% cotton ripstop fabric of the Odyssey is comfortable and light weight, both on and off the range. If you liked the Tad Gear Force 10 shorts, you'll be very pleased with the PDW Odyssey Shorts. Welt pocket fits a 30-round mag!